On a day like today, 62 years ago -April 15, 1957- one of the most loved and revered icons in Mexican popular culture died. Pedro Infante was born on November 18, 1917 in Mazatlán, Sinaloa. 62 years after his death, he is still an idol and the Yucatecans remember him every year with a tribute at the corner of the “Socorrito” located on 54 Street by 87 Street Centro where he crashed his plane a Consolidated B-24 Liberator. The house where he lived in the city of Merida for more than 10 years is located at Avenida Itzáes #587 and it is today, the “Boulevard Infante Hotel”. It belongs to a group of businessmen who turned it into a hotel in 1959. The house dates from the 40’s and it was in 1954 when it was acquired by Pedro Infante. Currently the hotel has 80 rooms with air conditioning and pool. It is very close to the City´s Historic Center. In the hotel, there is a gallery called “Amorcito Corazón” where some objects that were used by the Mexican actor are exhibited. Pedro Infante Cruz was also known as “The idol of Mexico”. He was a singer, actor, legend of the Golden Age of Mexican Cinema and the vernacular song, and many used to considered him as a Mexican Frank Sintra. Today he is still as loved, remebered and his music and movies remain as current as they were back then. The city of Mérida was his refuge. Pedro Infante loved Mérida. He was only married once, to Maria Luisa Leon. Lupita Torrentera and Irma Dorantes were not his wives before the law. Before becoming an actor-singer, he was a carpenter. He started as an extra in the film “En un burro tres baturros”. His first leading role was in the film “La feria de las flores”, in 1943. He accumulated 2,989 flight hours as a pilot. It was registered with the role name of “Capitán Cruz”. On April 15, 1957, when he crashed, Pedro Infante was piloting a Consolidated B-24 Liberator. He starred in 60+ films between 1939 and 1957 and recorded 344 songs in the studio. 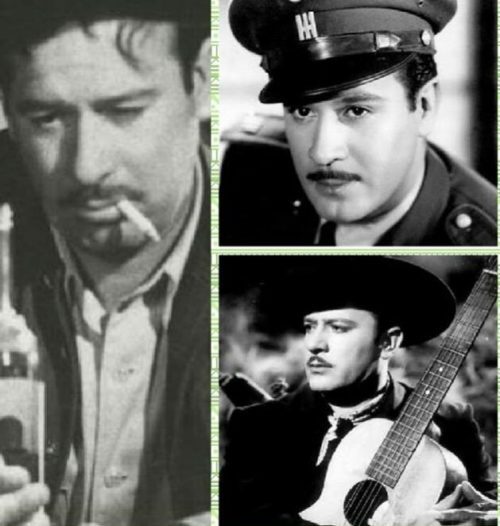 When he died, Pedro Infante had several film projects, among which were: “Las perlas de la Virgen”, “Suicídate mi amor”, “La Chamuscada”, a film in which he would play alongside Lola Beltrán, as well as a new album that already had the songs recorded. Although he always seemed happy, he suffered from clinical depression that worsened after the death of actress Miroslava Stern. Pedro worked out at least two hours a day and took great care of his diet. He rarely drank alcohol, and when he did, it was in moderation because he had diabetes. Between Pedro Infante and Luis Aguilar his co-star in the film “ATM: A toda máquina” there was bad blood since they were disputing the attention of Rosita Arenas, who was actually at the time, Abel Salazar’s wife. On one occasion, a boy who worked shining shoes in Mérida´s plaza grande, asked Pedro how much he charged for singing. The idol of Mexico replied that quite a bit, for which the boy offered to pay for only one song for his mother who was on her deathbed. Pedro Infante accepted and went to the boy’s house and sang to the woman more than one song which worried the boy to tears because how was he going to pay? they came to an arrangement, “boleadas” (shoeshines) for songs… This was just one of many times that he was scolded by his agent for singing WITHOUT CHARGE for people who admired him and couldn’t pay to see/listen to him.